I have made a donation. My step mother has had MS for many years and it is a cruel condition. Good luck with the fundraising and the itching! We saw the donation on Faceache, but didn't know who it was. We do now. Thank you very much. It's so appreciated. You are ALL incredible and a number of fans have already donated by either the Facebook page or the Virgin one. We are unable to set this page to end on the last day of 2019. This means we cannot avoid our supporters receiving messages to say the Fundraiser is ending in X number of days! So we have decided this page is closing BUT NOT THE FUNDRAISER. The Funds already raised will be claimed by MS Trust, including Gift Aid, where appropriate. Thank you for your understanding - any questions PM @Bristolatic please. It will give him something to do while growing his hair. notice. True... but still going strong as detailed below. £110 has been transferred to the VirginMoneyGiving page - just as a record, as the money will be claimed by MS Trust. @Bristolatic and I will keep you posted throughout the year. We do not yet know the Gift Aid on the Facebook money (see above). Thanks to many of you! New photos now on the Virgin page. 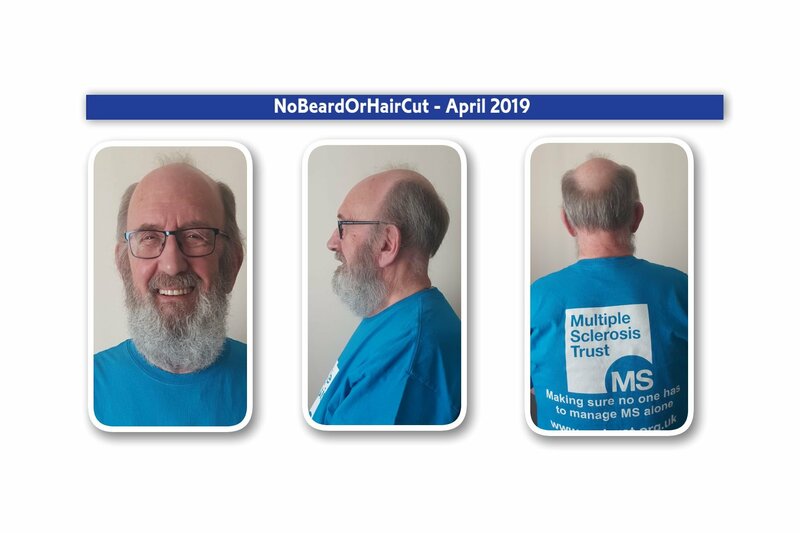 @Bristolatic has given me some more housekeeping to do for his NO BEARD OR HAIR CUT 2019 (COLOUR BY DECEMBER) fundraiser for MS Trust. You will recall, a week ago we had to close the Facebook wing of the fundraising due to technical reasons. We promised to update you once we knew how much Gift Aid had been received by MS Trust on the £110 transferred from FB to VirginMoneyGiving. "the Gift Aid is not claimed by us on Facebook as the consent process hasn't been confirmed as compliant and in line with our processes. This may change further down the line, but at present we are not receiving any Gift Aid from Facebook so the total [raised there] is £110." Another reason why the Facebook Fundraiser is not as favourable as the VirginMoneyGiving site. Rest assured, if you donated on FB, your donation is no less valuable to the work of MS Trust and is still shown in the Raised Offline total. Take a look - it is impressive! Well done Latics for the win at Crawley! It's﻿﻿ Sunday, time to update everyone about the VirginMoneyGiving MS Trust Fundraiser - or is that HairRaiser? The current target is £1000 - as this is a year--long challenge, watch how the target will change as the fund progresses. The donations, so far, are £480 or 48%. Those donations include £110 transferred from the original Facebook fund. Amazing progress, and @Bristolatic beard is growing well too.﻿﻿﻿﻿ His hair has also filled out from the usual clipped format. My Psychedelic HairyMan is on his way. Please note: we are standing the costs of dying @Bristolatic Beard and Hair at the end of the year. All other costs are ours too. What you see raised is for the MS Trust. We've received kind donations from Geoff Millard and from wsm sandy. I mention these because they are two kind donors we do not (think we) know in person, or from places we frequent online. I will edit this if we find out we do know them - and apologise in triplicate. The total donations, so far, are £532.50 plus Gift Aid not yet administered and claimed by MS Trust. @Bristolatic beard has been assessed by our local hairdresser, Sam. In other words, admired and stroked. Choosing dyes for November has begun, and hair treatment needed now was advised. It is the mention of plaiting that seems to make Pete shake with nerves - or appear to do so. There has been a lot of emailing and letter-writing by Pete, to newsprint and online media outlets. We hope to confirm his new image & fame soon! Me? I look fine as I am, and keep taking the medicines that get me through each day. Having the fingers that spread the online word keeps me happy. Please let us know if you would like to know more about the way MS affects my daily living. I'm a bit late with a Sunday update and nearly late with a Monday one. The good news is, I'm here now. We've received kind donations amounting to £85 this past week - fabulous. Thank you to all those involved. The total donations, so far, are £617.50 plus Gift Aid not yet administered and claimed by MS Trust. @Bristolatic beard has visibly increased. He is the proud owner of a little bottle of beard oil. A couple of drops tames the whiskers, you see. And makes them rather attractive to my nose. We have some other good news too - but we cannot confirm it quite yet. And a request - please let us know if you would like to know more about why, how and when Pete decided on this challenge. Either respond below or PM me. Until next week, enjoy the calm UK weather and wait for the Friday 1st March PHOTOGRAPHS. Our new photo banner (see below), taken on 1st March, indicates how much @Bristolatic's beard is filling out now. The reverse image shows his hair IS growing and has come further than immediately obvious if you remember Pete used to clip really short. Every week. He really did not like to be scruffy! Now look at him. Does anyone else, who has not yet donated, wish to make this type of pledge? Does anyone want a set of sponsor forms and leaflets to take to a club or group in their area? (the latter would work best by post if donations are cheques paid to "MS Trust" with sponsor forms signed with full details for Gift Aid. These (and the cheque/s) can then be returned to us for paying into the MS Trust bank account. We can be reached via this board, our FB profiles/Messenger and other places you may have read about this fundraiser. We'd love to hear what you think about this project. Yes, it's developing, although I'm not convinced that the tufty bits on the top of my head will amount to much. The beard, on the other hand, is doing quite well after its first couple of months. By the end of the year, I wonder if I could get a part in Only Fools and Horses if the BBC ever do a remake? "During the wowar". A big THANK YOU to @BristolaticMrs for keeping on top all the various things that need to be done, especially right now as she is suffering with another of those offshoots of Multiple Sclerosis, Trigeminal Neuralgia which has hit her for the first time in years. The facial pain is excruciating, rather like having a tooth drilled and filled without the anaesthetic. Naturally, a huge THANK YOU as well to everyone who has contributed to 61% of our initial target . Yes, it's developing, although I'm not convinced that the tufty bits on the top of my head will amount to much. Thanks, Tufty. I know how hard Saturdays can be so it's my job to help you cross the road when you are struggling. Hide behind the sofa and keep the kids away . It's for their own good. A bit of messing about this morning proves that a hairy face grows quicker than a hairy head. The three colours, taken from a Latics scarf, are all set for late November at @BristolaticMrs hairdresser. Before the dyeing (colour, that is) session, though, the manager of the local shopping precinct (Kings Chase in Kingswood, Bristol) has agreed to me having a table and fundraising display on 24th April (the middle of MS Awareness Week) and 21st August. I've never done anything like that before, so it should be interesting. Also, in August, after a visit to The Shard in London for a three course lunch (a present from son and daughter-in-law) @BristolaticMrs and I are going to the MS Trust's head office in Letchworth Garden City for an interview and video recording for the website. That hair is getting untidy and the beard - well! Don't panic 🤤 about the choice of T shirt here (neither MS Trust, nor Latics, just Saturday man caught lazing on a Saturday morning after a week caring for yours truly who has given us both a tough week. Fear not, full order is restored, for@Bristolatic is now sporting a Latics shirt to enjoy or endure the match by online commentary this afternoon. And I thought it was a unique look. Bah humbug. As updates go, this really isn't one. Nothing has happened in the last week (apart from at BP, of course) funding-wise, so the total stays as it was, unless outstanding sponsorship forms are ready for coming back. What has happened, however, is that MS and its cohorts are still hitting @BristolaticMrs with a vengeance. To combat the Trigeminal Neuralgia that has been plaguing her for the last umpteen weeks, there has been a sea change in medication; instantly ceasing 3 meds after several years, being replaced by just one that has some horrible side effects. Drastic action, but necessary. There is a cure for this very painful affliction; surgery, which uses a gamma knife to basically cut the nerve. No nerve, no pain. As long as the new meds do their stuff over the six weeks it takes to get to full strength, the surgeon won't have his day. At least the whiskers (mine, that is) have grown another couple of millimetres and are being eyed enviously by the hairdresser. Er, no, she doesn't want a beard of her own, just thinking up dastardly deeds to inflict on me before and during the colouring process near the end of the year. Edit: Another £10 arrived on Virgin Money Giving in the last couple of minutes. The total is now £637.50, which grows to £728.75 with Gift Aid. 2nd Edit: A further £20 was donated last night from a member of this board. The new total is £657.50 (£733.75 with Gift Aid). Thank you. Hello again. I'm still here but rather battle weary after a two-month run-in with Trigeminal Neuralgia that led to a change in several medications. I'm not yet saying I feel like my usual self but I am grateful to my GP, your very own @Bristolatic, and my two sons for their expertise and care, where respectively appropriate. Meanwhile, late as it is, here is the April photo banner. The beard is now a scarf-substitute and the hairline is creeping down to the neck collar. Comparing each month's photos is an encouragement to @Bristolatic who feels it's all a bit slow - not a word I can often apply to my dynamic hubby. The VirginMoneyGiving Fund now sits at a healthy £756.25 (including applicable Gift Aid). Off-topic but very important - thank for the gaols Latics - the fortunes of this Club are very much in our thoughts. Pete, I think I've just spotted you in the crowd at the BBC TV Antiques Road Show broadcast from Bristol. Sorry, Diego, it wasn't me. Did you think I was one of the antiques? Also, since the post yesterday from @BristolaticMrs, the fund has grown to £717.50 (£802.50 including Gift Aid). We are so grateful for every penny. Only a couple of weeks now before I'll be in the local shopping centre sat at a table with balloons, banners, leaflets, collection tins and the like. I hope it's a warm day! On Wednesday 24th April 2019, from 10am you can meet Pete & Beard at Kings Chase Shopping Centre - follow the link for directions etc. He will be at a table in the main shopping area. The table will hold lots of MS Trust goodies and information. So, if you happen to spend Easter week down near Bristol, or know anyone who lives locally, please give Pete as much support as you can. Offer to go and buy him a coffee (he will pay) and you will be a SuperStar. 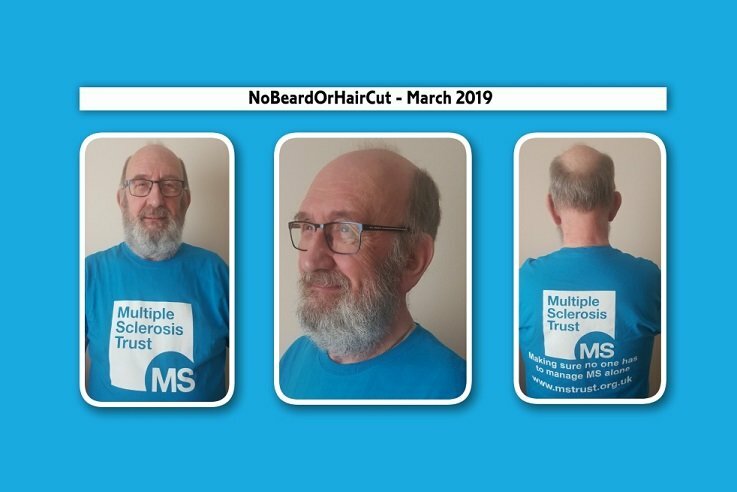 Wish him luck please as he makes shoppers aware of the MS Trust's work and promotes his NoBeardNoHairCut Fund in person. I have to pay for someone to buy me a coffee? There ain't no justice, I tells ya.